Selling wine requires you to have the knowledge of the types of white wine and be able to communicate to your guests in an unpretentious fashion. It is imperative that you know you types of white wine. 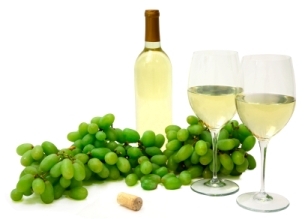 Wine is the natural product of grapes, or other fruits. It is the process by which the yeast, which forms naturally on the skins of the grapes, and oxygen convert the natural sugars of the juice into alcohol and carbon dioxide bubbles away, what remains is WINE! If you leave carbon dioxide in then you have sparkling wine. CHARDONNAY (shar-dn-ay) great California Chardonnays exhibit an intensity of aroma and flavor, being reminiscent of honey, citrus fruits, and vanilla. This grape is the primary grape in the Burgundy region of France; Chablis, White Burgundy, Pouilly Fuisse. SAUVIGNON BLANC ((SOH-vihn-yohn-Blahn) also known as Fume blanc, produces a dry wine of many different styles, some have the intensity of Chardonnay, light and refreshing. Smell of hay, fresh herbs, and smoke. Also primary grape of France?s Bordeaux region; Sancerre, and Pouilly fume regions. CHENIN BLANC (Shen-ihn Blahn) many styles, dry, crisp and others touch of sweetness, all have high acidity which makes them great food wines and the smell and flavors of melons. Chenin Blanc is also primary white grape in Loire Valley in France. RIESLING (rees-ling) known as White Riesling and Johannisberg Riesling. Styles ranging from dry to intensely sweet. Dry styles have high acidity, bloom, grapefruit, honey, and nectarines; sweeter wines exhibit the same smells in more pronounced fashion. GEWURTZRAMINER (guh-vurtz-trah-mee-ner) pungent, smells of cinnamon, clove and nutmeg. PINOT BLANC (Pee-noh Blahn) has a delicate, appley aroma great apertifs. SEMILLON (say-mee-yohn) when affected by botrytis (noble rot) this grape predominates in the sweet white wines of Bordeaux, such as Sauternes, Barsac, and Loupiac. Semillon is often blended with Sauvignon Blanc to create a well rounded and full bodied wine. VIOGNIER (vee-oh-Nynay) White grape grown in Rhone, producing Condrieu and Chateau Grillet, also mixed with Syrah to make Cote Rotie from Rhone. PINOT GRIS / GRIGIO (Pee-Noh-gree) light, fruity, slightly spicy, fresh and crisp.